“Social CRM” is a hot topic. More than four in five US online adults now participate socially. But, cutting through all the hype, organizations of all types are challenged to make hard decisions about the level of investment they should make in Social Computing technologies like blogs, wikis, forums, customer feedback tools, social networking sites, and customer community platforms. And, they want to know how these new capabilities should be, and can be, integrated with their transactional CRM systems. The key to navigating the Social CRM technology maze is define a plan that is tightly linked to business goals, focused on customer benefits, clearly identifies the processes and constituencies that will be affected, and specifies the associated information and capabilities required. 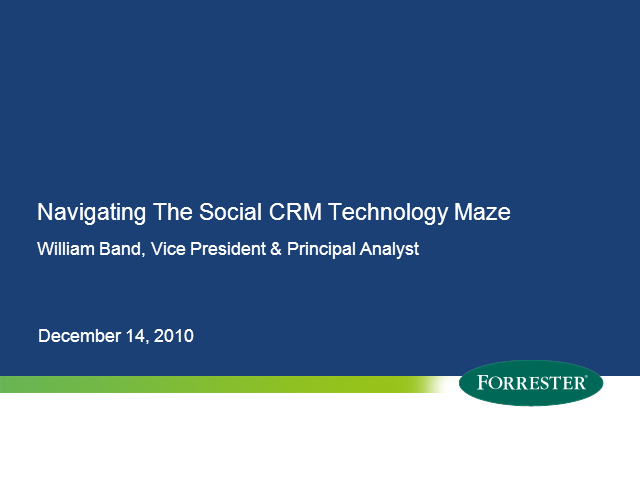 This presentation will provide an overview of Forrester’s perspective on defining a Social CRM strategy, and the implications for technology solution selection and implementation.